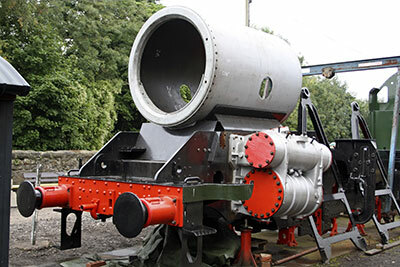 An order has been placed for rolling the boiler barrel sections with Barnshaws in the West Midlands. The short section behind the smokebox is a parallel tube, whereas the longer section to the firebox is an eccentric cone with the taper profile on the top. 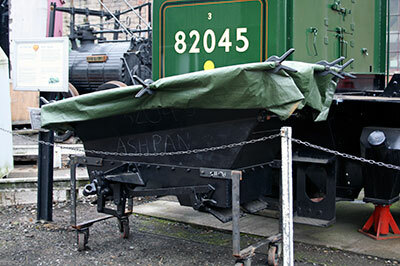 An order has also been placed with South Devon Railway Engineering for pressing the various plates into the shapes required to make up a Belpaire firebox. 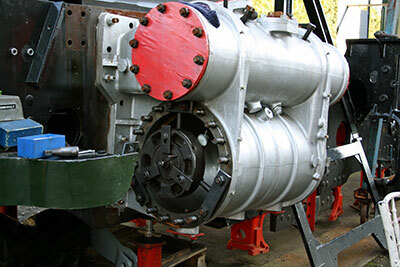 As some readers may be aware the boiler department of South Devon Railway Engineering have a large press which makes relatively easy work of producing various shapes, with the appropriate dies, out of the metal offered to it. 82045’s smokebox wrapper with the front ring temporarily bolted in place was placed on the saddle for the SVR’s Autumn Gala. 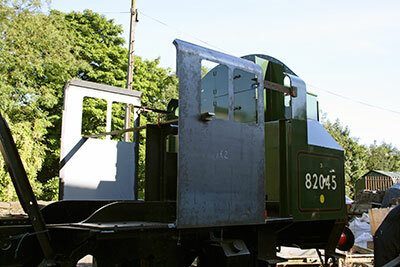 There proved to be insufficient time to have the smokebox door fitted in time for the event. The assembly will be returned to ground level for work to continue on fitting the door hinges and locking arrangement before building up towards riveting the front ring to the wrapper. An order has been placed for casting the chimney and vacuum ejector exhaust ring. The front and rear end covers for the cylinders have been cast but not yet machined. The front valve chest covers are about to be cast whilst pattern making is in progress on the rear valve chest covers. Various parts of the cab structure may appear on the chassis and then disappear again as work proceeds on getting all the various sections in the right place and mating up correctly with each other. Whitemetalling of the bearing surfaces of the driving wheel axleboxes is in progress with machining of these areas to follow. The Boiler Appeal continues to amaze us with its success: there are some very generous people out there. Thank you so much, all of you! 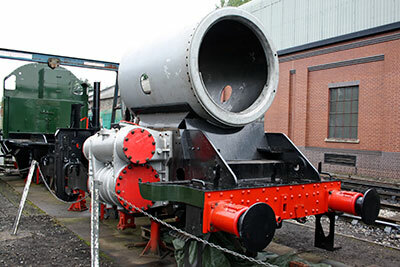 Now that work on both the boiler barrel and the firebox is due to start imminently, it is great to know that we have the financial resources necessary to tackle much of this big job, but equally important that we keep the funds coming in. The Autumn Gala was a runaway success - a combination of Britannia, Royal Scot and the nice weather seems to have done the trick - and this has been reflected in our revenue over the four-day event, which Barbara will report on below. On the subject of generosity, our target of raising the money for the engine's motion - going ahead alongside the boiler appeal - has been given a fantastic boost by well-known railway photographer Neville Wellings, who has sponsored all four coupling rods. Thanks, Neville: that was a wonderful surprise. 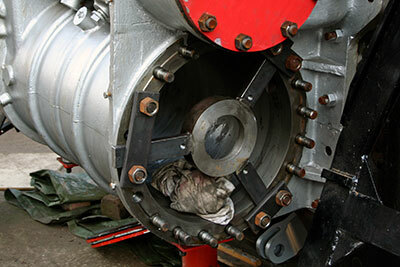 We now therefore have the biggest components of the motion in the bag, as we already possess the connecting rod forgings. Working downwards in size, the "Eardington Flyer", our second special train (see below), is being run in April to raise funds for the two return crank rods. Next ones down are the two radius rods, forgings for which come in at approximately £2,000 per rod. If you are interested in sponsoring one of these highly visible items (or any other motion component), please get in touch with Chris. What a wonderful gala it was. The weather was kind and seemed to put smiles on faces everywhere. The visiting locomotives were fabulous and put on a great show for us all. Donations for 82045 amounted to approximately £5,000 which is absolutely splendid – especially when this sum is Gift Aided (giving us a further 25%). When sales are added the Trust banked over £7,000 in the boiler account - a splendid result for the weekend! Thanks to everyone for their help and hard work over the gala weekend. On Thursday 17th September we were honoured to receive a visit from our Royal Patron, HRH The Duke of Gloucester. His Royal Highness was most interested to see the progress on our locomotive and chatted about the history of the class and the difficulties of building a new locomotive in today's world. We made a presentation of a Bachmann model of 82045 to the Duke and within a couple of days received a charming letter thanking us and expressing his delight at the progress on 82045. Just a reminder that the next AGM is to be held at Kidderminster Railway Museum (upstairs Lecture Theatre) at 2.00 p.m. on Saturday 9th April 2016. Following the success of our first special train in April (it raised the best part of £5,000 towards the boiler appeal), Bryan Clarke and his little group are organising another fundraiser, “The Eardington Flyer”, which will run on Friday 22nd April 2016. 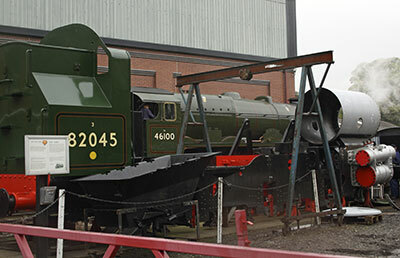 Funds raised will again go towards the boiler appeal and also to our 'motion' account. The train will again feature Collett 0-4-2 tank 1450 heading a train of vintage GWR stock. This time, we are doing a longer round trip, as far as Highley, where the engine will take water and run round its train. We then proceed back to Eardington for a stop of about one and a half hours and a variety of nice jollies again, before returning to Bridgnorth. Departure time from Bridgnorth is 11.00 a.m., and we expect to be back there by 3.00 p.m. Ticket price remains unchanged at £19.65, but this time we are offering a chance for three lucky winners to have a footplate ride. If you would like to be entered for the draw, please add £5.00 to your remittance and your name will be placed in a hat. First prize will be Bridgnorth-Highley, second Highley-Eardington and third Eardington-Bridgnorth. Better odds than the National Lottery, and worth a flutter! 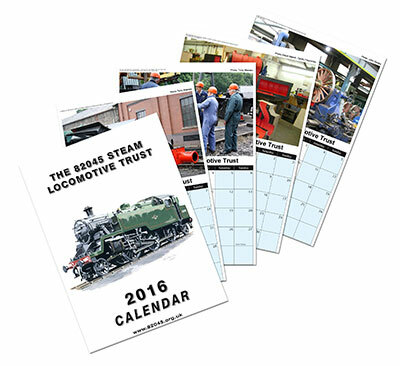 Cheques, for £19.65 or £24.65 ('premium ticket'), should be made out to The 82045 Steam Locomotive Trust. 1450’s footplate can best be described as cosy, but the forward view through the cab spectacle windows is the best I've ever experienced on a steam loco. Download the order form. The smokebox with the front ring temporarily bolted in place was placed on the saddle for the SVR’s Autumn Gala. Photos: Tony Massau. The ashpan assembly. Photo: Tony Massau.